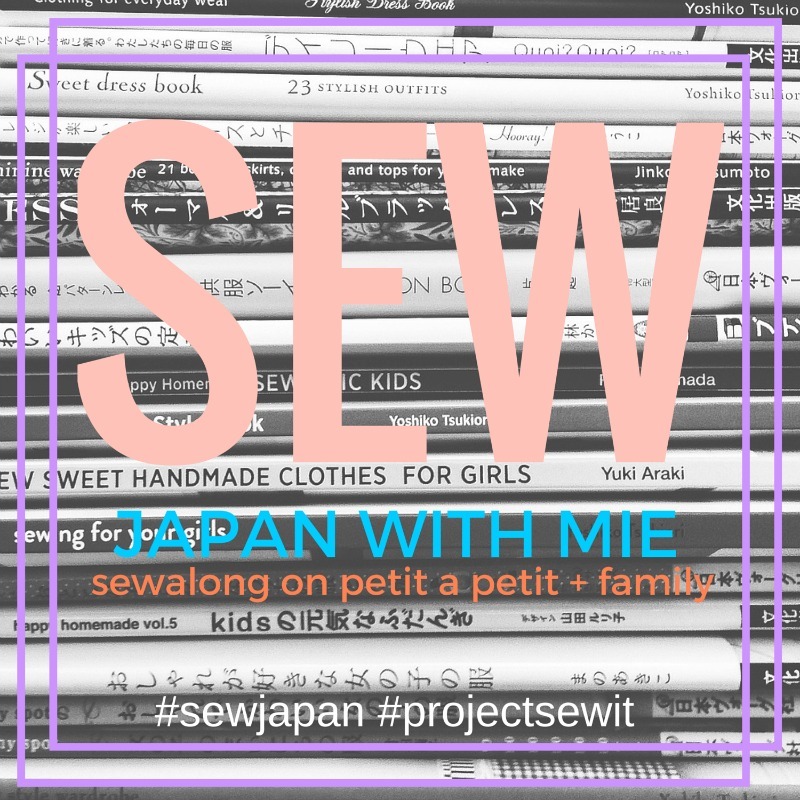 Sewing Like Mad: Winter Version of Inari Tee Dress. 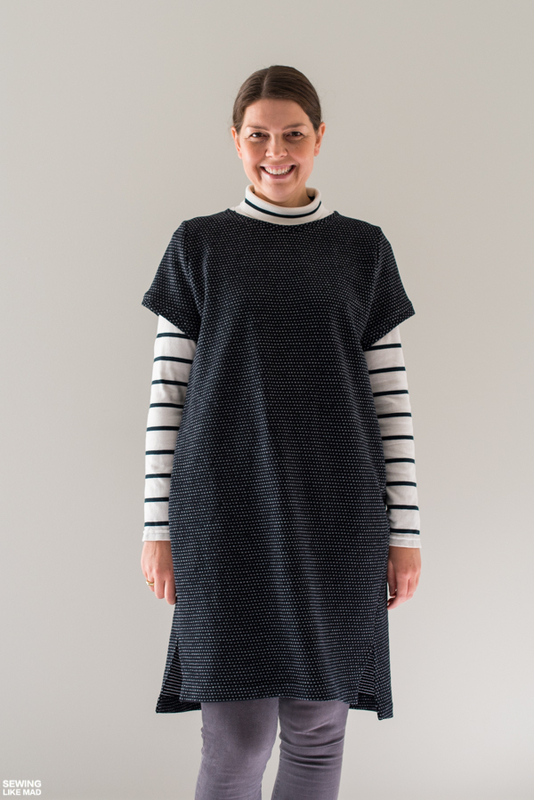 Winter Version of Inari Tee Dress. I have already declared on Instagram that I have a newfound friendship with the Inari Tee Dress from Named Clothing. That was when I posted a burgundy version. But I actually made this one before the burgundy and have been saving it for a cold weather blog post. I think styling it with a long-sleeved turtleneck and tight jeans, plus making it in a stable medium weight knit makes it the perfect early winter outfit. Besides finally getting the size right (more about that later), the fabric could really not be more perfect for this winter version. It's black SILMU from Nosh Organics. And apparently I'm not the only one head over heels in love with this fabrics because it's sold out...again. HERE is a link to the two colors available at the moment, light olive and Maple Sugar. Don't miss beautiful Emi in her Maple Sugar SILMU Toaster 2 Sweater HERE. Told you, this fabric is magic. 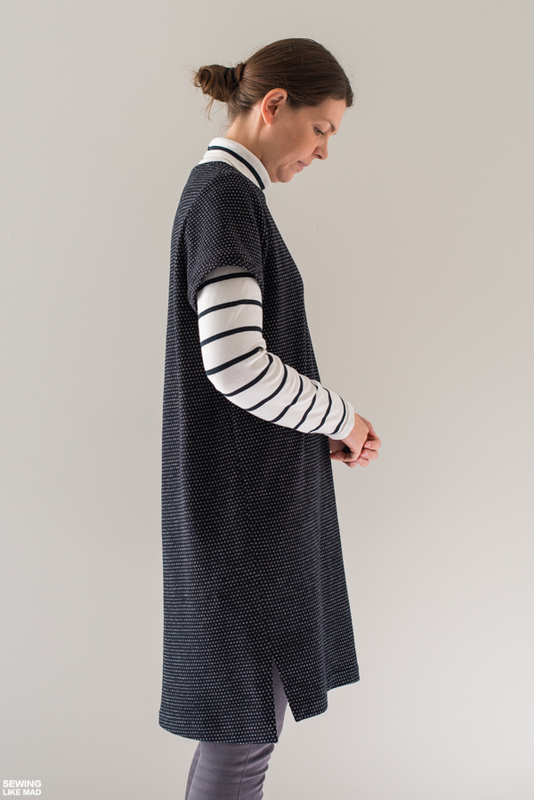 It's this wonderfully structured and stable knit with tiny white dots knitted throughout the fabric. It's screaming cardigans and sweaters but as you can see, it certainly also works for dresses. And I could actually also imagine some sort of relaxed styled pants. How about these super cool Wrap Trousers from Burda Style? I actually own that pattern, maybe I should take one for the team and actually make them?! 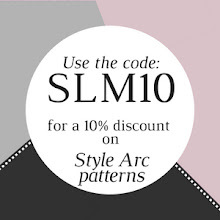 Or the Brooklyn Knit Pant from Style Arc Patterns? But before we swim away in all the possibilities, maybe we should talk about what I actually ended up using my preciousssss black SILMU for. 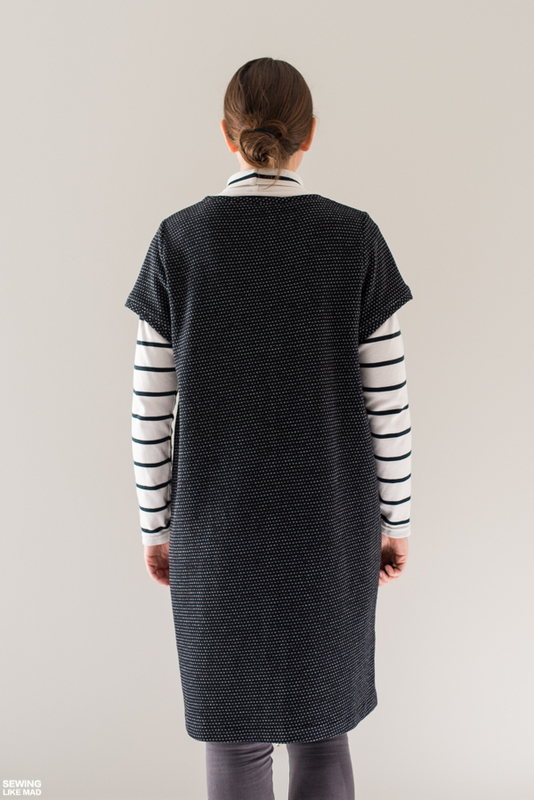 The Inari Dress from Named Clothing. Yes, we are going full on Finnish for this post. Both patterns in this post is from Finnish Named and both fabrics are from Finnish Nosh. 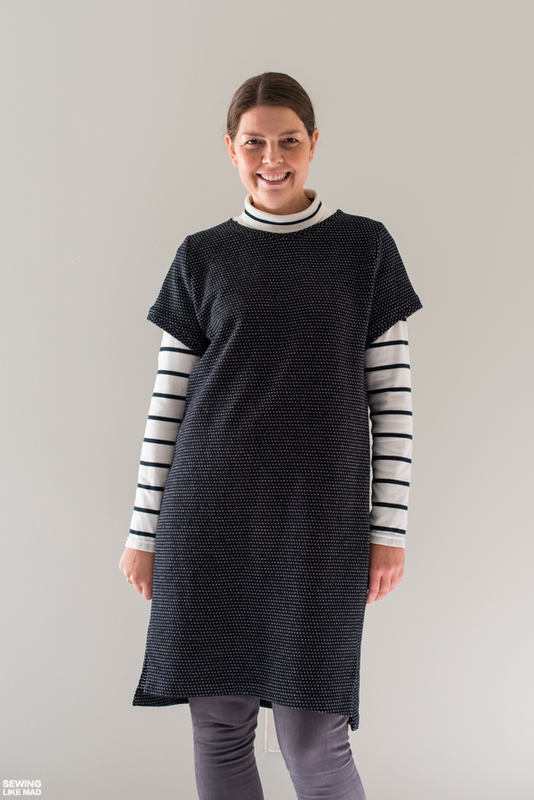 So I have blogged about the Inari Tee Dress before HERE and it was interesting to go back now and re-read that post because I was fairly positive. Although I did mention that the first one I made (charcoal grey) looked okay but sort of crawled up my hips when I was moving and it was also too short. At that point I obviously didn't know the longterm wearing verdict, but I can say now that I have not worn it that much because it's annoying to constantly have to pull it back down. The second one (light grey, also in that post) I sort of graded bigger, longer and wider while cutting the fabric, ahem. I have worn that one quite a bit although my husband once asked if I was wearing pajamas one time I was on my way out the door in it, lol. And I think it did loosen a bit too much 'Inari magic' in my unorthodox grading-while-cutting-session. Let me just be absolutely clear though. I was positive about the actual pattern in my previous post and that has not changed. Drafting and technical wise it's an excellent pattern. I think I just got the size wrong. It took me over a year and a half to test it out but I finally printed the pattern one size up (so this is a size 42) and then simply added 5 cm at the lengthening line and that was all it took. Boom, I finally felt that magic that SO many sewing ladies out there before me, have talked about. I shortened the sleeve cuff, skipped the fold up that the original pattern suggest, and simply sewed it on as a ribbing. That way it's not too bulky to wear under cardigans which is something I pretty much wear every day during the winter. The turtleneck is the Paola Turtleneck Tee and I have already blogged about this exact top HERE. I feel like the Paola has been overlooked in the sea of Named patterns. I'm guessing the flesh colored version they made for their collection sample didn't really help sales, ahem. But if you can look past that, you really get a GREAT and very versatile pattern. I've made my sister a dress with it HERE. 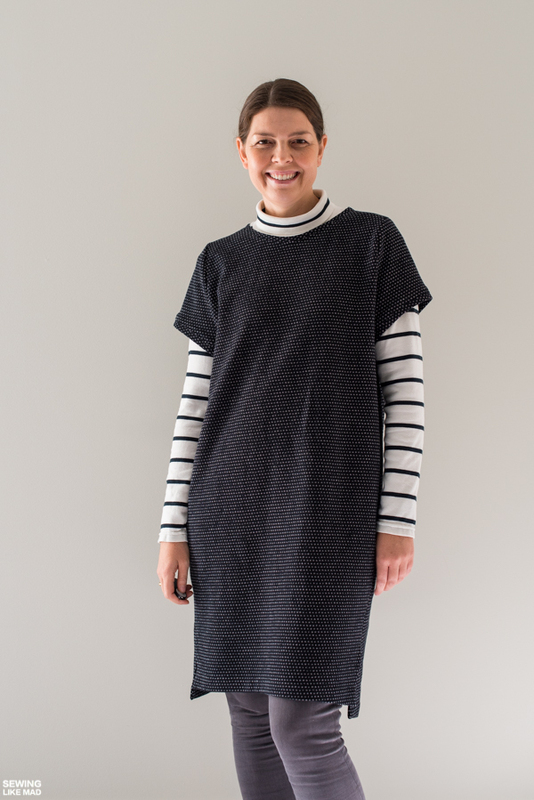 And a charcoal basic that will literally go with everything HERE. And a tighter, short sleeved and more moderate 'turtleneck' summer version HERE. 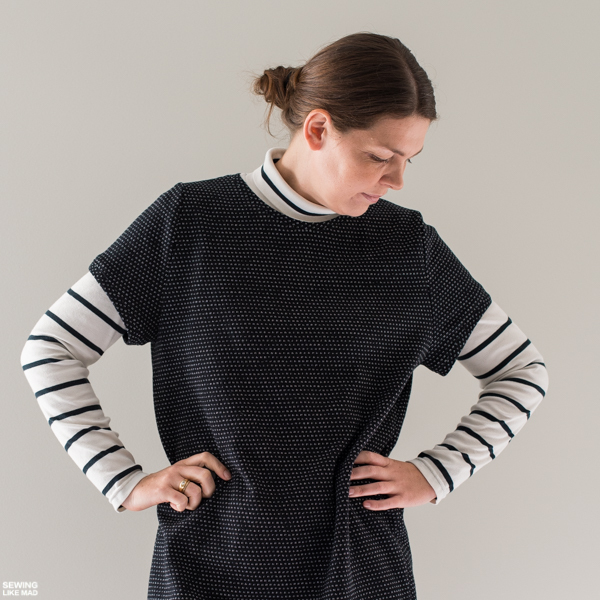 And HERE is my wearable muslin in a striped thin sweater knit (in this post I'm also telling you what #sewingtall changes I did to the pattern). Get your Nosh fabrics HERE. Get your Inari tee Dress HERE. Get your Paola Turtleneck Tee HERE. Don't you love it when husbands make comments/ask questions like that? I really like your dress. Oh my gosh, how much do I love this dress!! In SILMU!!! Oh let me count the ways.... Seriously this dress is all kinds of amazing, and paired with the turtleneck and pants, it's perfect styling! I want to make another Inari soon. I haven't made one since my too-big muslin well over a year ago, haha. And YES, please make those Burda trousers!! Looks great! Love the fabric so much! I think it’s even perfect for winters here! I have the Burda pattern too, I think it would look great on you! I never really liked the Inari pattern but paired this way it looks great! I think Inari works best in stable knit like this one. All of the sudden one can see the shape of this dress, and it is pretty awesome. Love the way you styled it. I considered getting the turtleneck pattern. Maybe next winter. It is all about summer sewing here at the moment!